I got this tip from the Check out clerk at Publix, a nice smart older lady… when I was telling her I wanted to make Vegetable Stock she told me to save all the stuff you would throw away when you are cutting up your vegetables- carrot tops, celery leaves, onion skins, and this one had the beet greens ( I would have eaten them, but my husband was making root vegetables, so they weren’t a root…) Anyway, we keep a gallon zip top bag in the freezer and add the veggie parts until it is full. Then you dump it in a large pot…”stock pot” and cook with some salt and pepper and several hours later on low heat. I let it cool and then get a large strainer and pour it through to get just the liquid. Put in clean glass jars or plastic containers. Then you have vegetable stock that you can pay around $3.00 a can for 15 1/2 ounces. 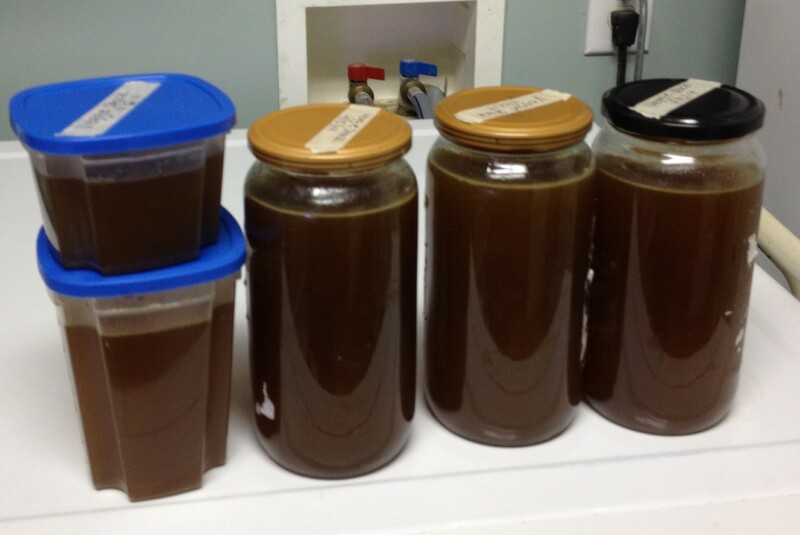 I just made about 8 cans of veggie stock with free ingredients $24.00. You could can them, but mine go straight in the freezer… Warning… this is an ingredient for soup, not a final product… you will be disappointed if you try to eat it plain. But it’s a good for adding to a recipe that calls for vegetable stock, or substituting for chicken or beef stock if you are vegan or vegetarian. The cooked mush goes to the compost pile for the worms and bacteria to enjoy. One more thing…use organically grown or home grown vegetables as you are probably getting all the pesticides that are on the veggies when you do this. Remember the 3 R’s Reduce, Reuse and Recycle. 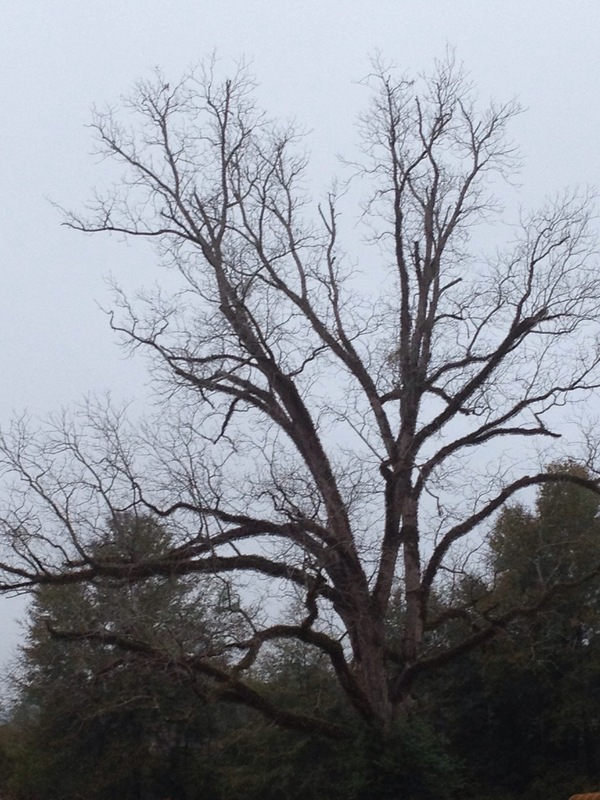 Spring is edging to life in Central Alabama. The Ramps I planted last week are coming up! Ramps are not that thing you drive your wheelchair up, but instead a shade-loving edible plants with a taste like onions. I ordered 10 ramps from Pine Tree Gardens http://www.superseeds.com/ and they arrived in the mail in a padded envelope, ready to be planted. After researching them carefully in my literature which included Vegetable Literacy by Deborah Madison which included several delicious sounding recipes and a beautiful photograph. 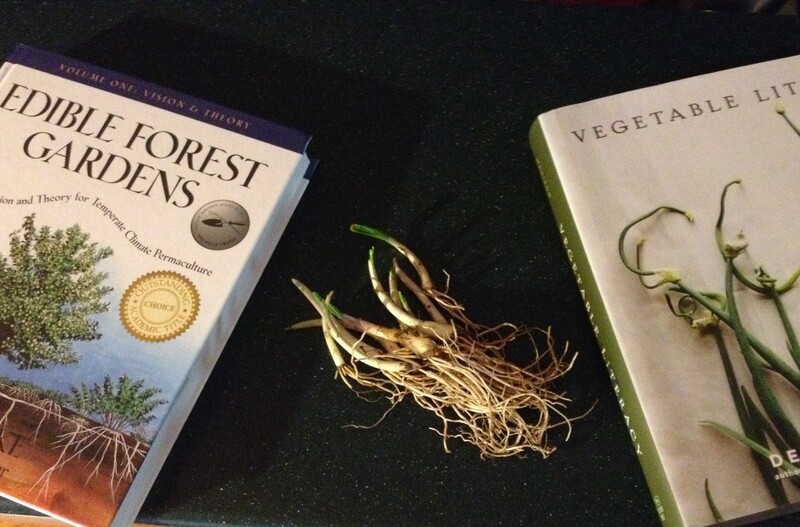 Then I looked in Edible Forest Gardens by Dave Jacke and Eric Toensmeier http://www.edibleforestgardens.com who wax ecstatic over ramps in multiple places in their 2 volumes, so I looked up all the references and studied the best way to plant my ramps. They like moist woodland soil, which we have plenty of, so I selected 2 spots near our house, one in the front circle, and a spot beyond the deck in the back yard. You can eat both leaves and roots, but until your patch is well established, you will probably only want to taste the leaves, as you want them to spread. I planted them in the moist soil with a bit of my special composted horse manure that my friend Beth kindly allowed me to haul away. In the hole I added a half teaspoonful of mycorrhizal inncoulant which is a fungus that stimulates plant roots to grow. You can buy it from Amazon look up Xtreme Gardening Mykos. 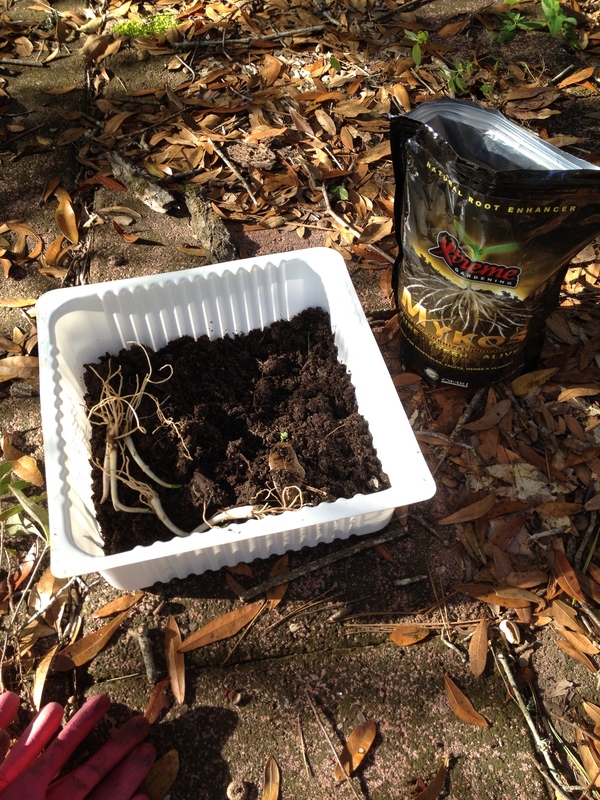 At my Spiral Ridge PDC http://www.spiralridgepermaculture.com/ we called it Magic Sprinkle Powder and we put it on the roots of all the things we planted. What have you planted in your Garden this year? Or maybe it is still too soon…what will you plant? The Swing Awaits… we have received the news we could potentially “retire”… Although retirement is not really my style… When I was unemployed last year I found tons of interesting things to do…permaculture, volunteering, knitting, exploring cooking and food, deeper spiritual experiences, more environmental work, travel and so on. Going back to work 1/2 time… 40 hours every other week is okay, but the distance to the job is a problem. So the essential question we’ve been wrestling with these past several weeks is the elusive question of how much money do you need… I want to talk about this without getting specific. Our financial adviser had a number which we thought was pretty high… but then you contemplate catastrophic events and then you think OH NO! WORK LONGER. We don’t have long term care insurance… should we buy it? Can we afford it? My grandparents did not have it, and my grandmother did live in a Long Term Care facility for several years and died before her money ran out. She was not happy about outliving her spouse by 12 or 13 years, but she was not unhappy those last few years. She died before she turned 100 by about 6 months. My father is fragile and may go at any time, but I suspect Long Term Care will not be part of his future, thankfully. My mother may last a long time yet, but she plans to pay for her own Long Term Care if needed. My Father-in-Law lived with a son and his girlfriend, they took good care of him in his own home, where he died. He had a modest estate that was shared by his many children. But we are young at 57 and 58… so when we contemplate not going to work every day it is scary. Will we get on each others nerves? Will we get bored staring at each other across the table? Will we have enough money to do what we want to do, make repairs, replace broken things, travel? I have a good friend who did it. She and her husband retired when he turned 58. They have not looked back. They wrestle with health issues occasionally, cared for her daughters family for a year, then her mother for another year, but have traveled all over the United States, Canada and some to Europe. They are happy they did it. She says I talked her into it, I had read a book called Your Money or Your Life by Joe Dominguez and Vicki Robin, and she read it too, and did what the book suggested. We are not so different from them… we like each other, we like to travel, we like to garden and have infinite volunteer opportunities, so I suspect we will do just fine. We have been doing many of the things in Your Money or Your Life and we are almost there. I still don’t know what to do about Long Term Care Insurance. What is a permaculture solution to Long Term Care? 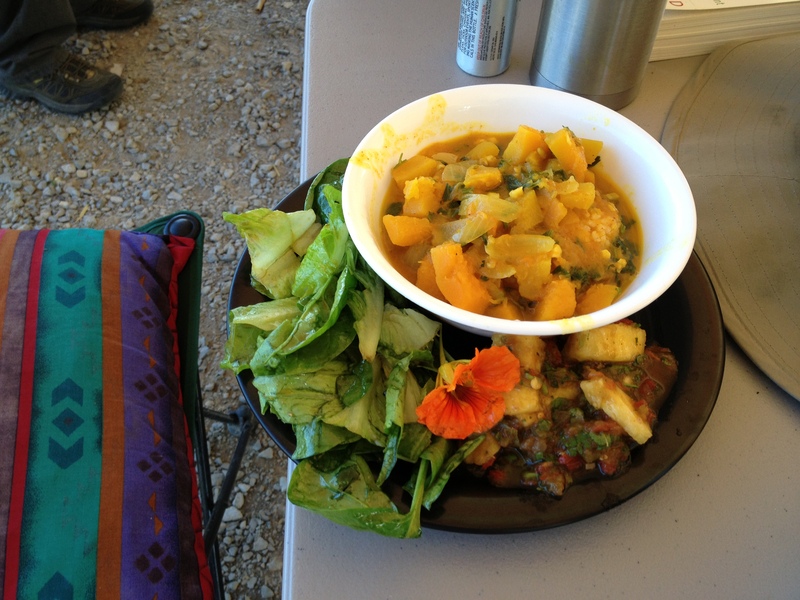 This is the account of my adventure at the Permaculture Design Course at Spiral Ridge in October of 2013 http://www.spiralridgepermaculture.com. My notes are somewhat muddled about Day 4, and I think they crammed some of the things from day 3 into it, which I already talked about. Our group decided to do the area around the proposed house site, and we were to use an already developed base map. But the base map was not too good so we spent a good piece of the morning messing around looking at the land and trying to get the map right, Actually a fairly useful real life exercise. The maps were posterboard about 2 foot x 4 foot. 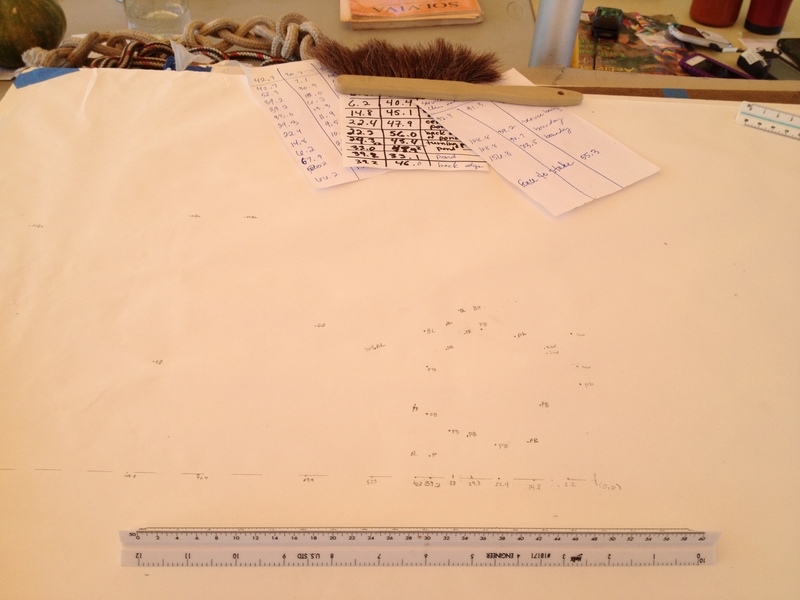 The base map is black lines showing existing structures that you then use tracing paper to make overlays of the various things that exist on the land…our goal was an overlay of each of the scale of permanence which I talked about last time… Climate, landform, water, etc. Climate is a piece you look up on the internet, from various government websites. Since the government was shut down, so were the websites. So we copied the information from previous PDC classes. I tried to do some climate research this morning, and found it is interesting and challenging because there is so much information. The lecture was not too useful, partly because the lecturer ( I think it was Jessie) was not wanting to delve into controversy. I think it might have been interesting, because the group was fairly open minded. We had a lecture about water and Landform next. Landform is contours, slopes, etc and how to visualize on paper. I think they talked about swales some. A swale is a trench on the contour. The other part of Water management is ponds. Permaculture practice likes ponds, because they are excellent ways to store water high on land. But they are also tricky to manage. They leak. Only the very small pond at the top of the land didn’t leak, I suspect they had used that pond fabric in it, but that is expensive to do in larger ponds. I think they are hoping that the other 2 ponds will eventually stop leaking when enough clay sediment collect in the bottom of them. A goal is to build key line dams on contour and create storage ponds. A significant goal with water is to slow it, spread it and sink it onto the land, and not let it run off like the “Grand Canyon” thru the lower part of the Quinn property. Some of the case studies we reviewed showed local increases in the water table due to permaculture practices. The afternoon lecture was about Terra- Aqua culture…using land and water together… The Austrian Sepp Holtzer uses a series of ponds high in the alps to grow fish and then water the land, but his techniques have not been easy to reproduce other places. Two other models that might be easier to use… Viet nam jungle villages were they use Bamboo, pigs, ducks, fish ponds,crops on contour, the crops are at the bottom of the hill and they are fertilized by the pigs, ducks and fish higher up the hill. Another model would be the Aztecs in Mexico who created “Chinapas” fingers of land made out of willow branches and sludge into the water to create tiny inlets to catch fish and then grow crops on the fingers sticking out into the water. That evening we were invited to a lecture on the state of the Climate at the Eco-village down at the Farm ( the place I was staying). Attached to the dorm I was staying in (which I would guess was about 20 years old) was a new conference center space which is partially completed. (Cliff says it will never be finished) It was completed enough that it could be used for lectures, but it has no doors, just flaps of plastic where the doors should be. 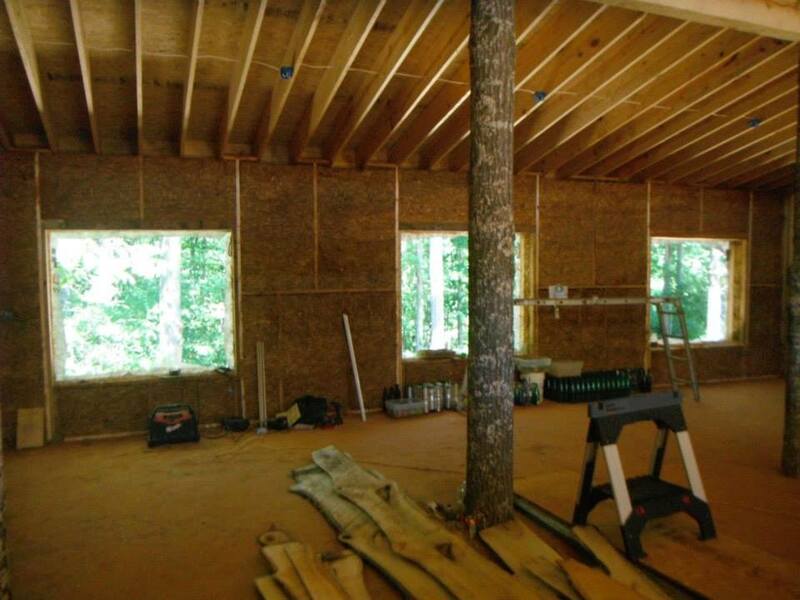 Inside the walls were partly completed with straw bale construction. At the time the lecture was supposed to start, Miriam and I and the speaker, Albert Bates and 2 other people were there. We indicated that a few others were coming, so they waited about 15 more minutes for the rest of our group to arrive (they were lost or couldn’t get in the gate… another flaw of living at the farm. Albert Bates is a long time resident of the Farm (arrived in 1972, he joked that he was a latecomer) and the De-facto force of the Eco-village. He hired Cliff to run the Ecovillage sometime back, but I don’t think he let Cliff do anything, so Cliff moved on, but they seem to coexist. I also do not think they replaced Cliff when he left. However, the lecture did proceed after everyone arrived. The lecturer was a very young man from a Environmental group in Washington who had a power point presentation, which was followed by a brief discussion. He suggested maybe we could use non-violent techniques like the civil rights movement to mobilize people to march on Washington DC. He pointed out that Washington could easily be shut down. (For a while perhaps) He though we should shame our legislators for their inaction about the Environment. The assembled group was polite but I think we are more motivated to grow food than to March on Washington, who won’t care anyway. Afterwards Miriam and I had wine and ice cream with the Lecturer, his friend and Albert Bates. After about 30 minutes, another elderly hippie named Frank showed up, apologizing that he had missed the lecture. He had been talking to some folks from another town about mushroom gardening and had just returned. He talked at length about his calculation that we could stop global warming if we could sequester enough carbon by planting sufficient number of trees. He had calculated that there was enough arable land to do this on the planet. This was intriguing to me… I remembered the miles of medium strip I had passed a few days before when I drove up to Tennessee. My Husband has told me he wants to do “Vegan for Lent” again this year. Lent is the season in the Christian calendar which comes immediately after Mardi Gras ends on Fat Tuesday with Ash Wednesday and lasts 40 days until Easter. It is traditionally a time for Fasting and Prayer. We have found it to be a helpful way of reorienting our eating habits. Giving up meat and dairy has made us mindful of our basically unhealthy eating habits. It also means that we almost cannot eat out as, at least in Alabama, almost all food is based around the meat portion. Even Vegetarian options include some cheese. I am challenging myself as to why to do this fast… It is a fast of meat and cheese, in researching this, I turned to a favorite book of mine, “Celebration of Discipline” by Richard J Foster, which was first published in 1978, and available in new and used copies (and Kindle) on Amazon.com. Foster discusses fasting in an entire chapter in that book. Daniel and his followers abstained from meat, wine and other delicacies for a period of 3 weeks… Many religions besides Christians engage in fasting. Jesus fasted for 40 days in the wilderness, probably this is the reason Christians honor Lent for 40 days. Much of the world I have lived in has never even heard of Lent, and will look blankly if you bring up the subject, most people around here have heard of Mardi Gras, so some have also heard of Lent. When I visited my son in New Orleans however, everyone gives up stuff for lent, Agnostic and Jew alike, I guess it is part of the culture of the “Land of Mardi Gras”. Foster also mentions that most of us cannot imagine giving up food at all– we were raised with the idea that healthy eating requires 3 meals a day and cookies and Kool-Aid after school. I was amazed when I read “City of Joy” by Dominique La Pierre 1992 about a slum in Calcutta… A Polish priest chooses to live there among the poor Indians. He discovers that he can live on a tiny amount of food compared to what most Western people eat. He loses a lot of weight, but in the end is not unhealthy. We do not need nearly as much protein as our culture advises, and certainly not animal protein. I myself am not opposed to the humane slaughter of animals. But much of what we do to create hamburgers and chicken fingers is not humane or healthy… It is cruel to both animal and human-those who are slaughtered and those who do the slaughtering. And the end result should not be eaten. Yet I still eat out and occasionally buy meat to cook at home. But I am definitely thinking about this choice. One of the classes offered at the Permaculture Design Course was about the humane slaughter of animals to eat. I chose to participate. We killed some chickens which we later ate. We learned how to hold the chicken and slit their throats in a humane way. We put them in a tube with their heads down so they would not flop around. Then we removed the feathers and removed the internal organs. I wanted to know if I could do it. The experience definitely added another level of thoughtfulness about what I choose to eat. So when I give up meat and cheese for Lent, I do it with the thoughtfulness of a fast. I need to think about what I eat. Is it good for me? Is it good for the planet? Is it good for my fellow humans? I think we could grow food much more humanely than we are currently doing it, and what would Jesus say about how it is done…I suspect he would have a lot more to say than whether our business was open on Sunday or not. Finally, I choose to do what I do not to be prideful about being “holier” than the next person, but with humility and prayer, to build a stronger connection to God. Our assignment was to pick a base map to work with, interview our clients and come up with a design for a permaculture landscape design. Our practice clients were our instructors Cliff and Jen, which we already knew a lot about. We chose to design the space around their future house, which in permaculture jargon is Zone 1…easily accessible every day. But before we could pick a base map, we had to learn about base mapping. Base mapping is how to map the topography of the Land. 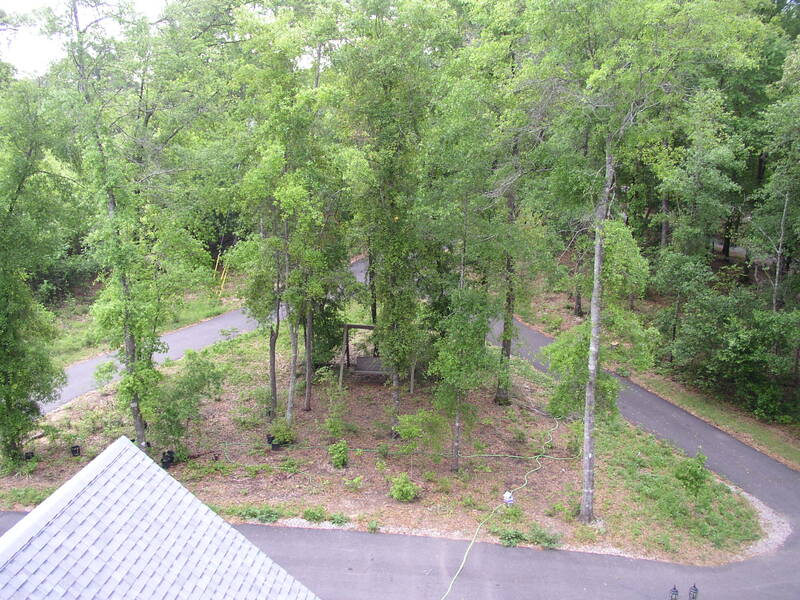 We were assigned to map an area below the future house sit that contained a pond and several groves of native trees that they were interested in keeping. We first extended from a previous base map and the area mapped was the length of a tape measure- 300ft and the width of another about 100 feet. So base mapping is like making a Cartesian graph with x and y points. Extension (x) and Offset (y). The corner of the map 0,0 was measured from the previous map. We then plotted relevant points along the 300 ft extension, being careful to keep the second tape measure at a 90 degree angle from the first, A triangle with a raised edge was helpful to keep it straight. The points we measured were the spillway to the point (each side), the rim of the point (at about 8 different points, and then edge of the dam that formed the pond etc. We used engineer scale with inches (which is divided into 10ths of an inch. One student asked why we didn’t use metric, our teacher said because this is what is easily available in the United States. After we completed the pond, we went on down the hill and measured the relevant groves of trees. I think they were Chestnuts and service berries. Then we had a piece of gridded paper we placed under our base map and plotted the points on the map to complete the base map. It was hot and tedious work. It is pretty important to get accurate descriptions of each point to make sure you have it right. The map looked pretty good when we got it done. Then we had a lecture in great detail about site assessment. The first step is the Scale of Permanence- a way of observing our landscape– starting with the hardest to change to the easiest to change. The next tool we were given was a Team building tool called the 8 shields model. It was modeled after how native cultures operated and each of the 8 compass directions is a list of characteristics and we were to choose which best fit our personality… East- Beginning, South- Hard Work, North- Oversight, West- community. There were many more criteria, and it worked well for the other 2 groups, but our group was quite dysfunctional. I guess the best part was that we managed to muddle through with getting hostile, but I think it suppressed some of the creativity that we might have had had we allowed ourselves to be more spontaneous. We came up with a list of questions to ask our clients and then asked them in front of the entire group. Cliff reminded us that his experience is that it is best to have both husband and wife to be in on both the interview and design approval meetings so that everyone is on the same page. He sends a list of preliminary questions so they have an idea what they want when he interviews them. They, of course, gave excellent answers to our questions. 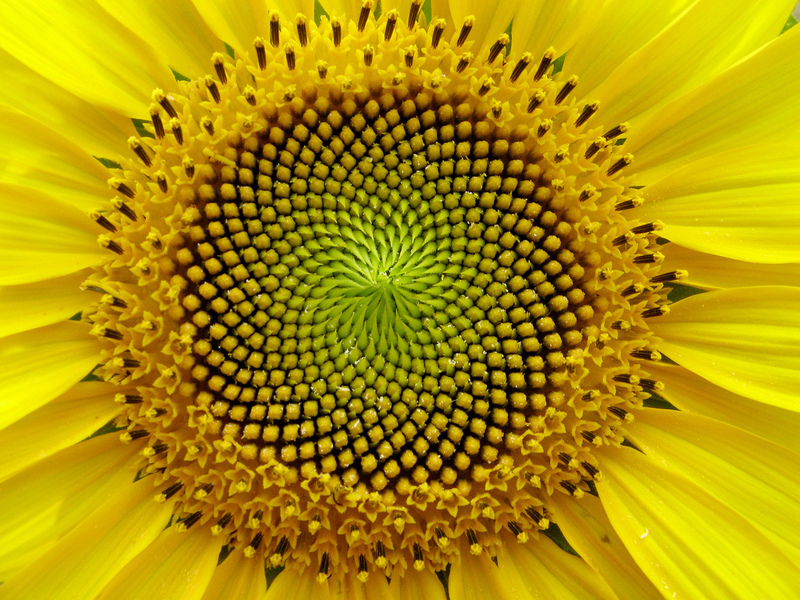 If you count any given spiral in the sunflower it will probably be a number in the fibonacchi sequence. Biology begats math and physics or is it the other way around? And I’m thinking there’s a spiritual element to this too, but maybe I’m thinking too hard. I give credit to Wikipedia for information about Fibonacchi and of course my friends at Spiral Ridge who taught me about this…http://www.spiralridge.com. Go to their next permaculture course, you will be glad you did. Day 2 started with hearty breakfast…scrambled eggs, oatmeal, yogurt and assorted nice things to add to that like nuts, raisins, honey, jam etc. We also had coffee around the campfire every morning. They assigned chores- animal care, working in the green house, and more boring stuff like dish washing and wood chopping. Some of our crew cheerfully volunteered for stuff like dish washing and wood chopping. Some of our crew cheerfully volunteered for humanure duty- which meant emptying the bucket into the humanure pile, which must cook for a year before it can go out as fertilizer. They don’t put it on vegetables. They cover each poop with cedar chips from an Amish saw mill. This was not a required duty. 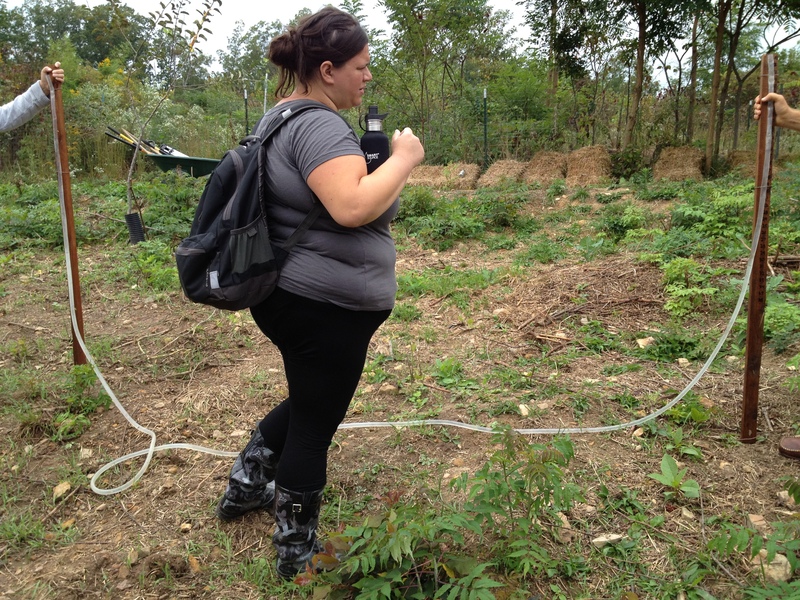 Site Tour- we walked the upper part of the Farm…it was so interesting that we only got around to the top half. Some highlights…Water cistern attached to the Well- covered in insulation. and attached to a solar panel. Whenever the sun shines, water pumps into the cistern (5000 gal) which is used for clean drinking water and other uses. They also collect rain water from roofs, and grey water from washing and showers which is funneled into tanks and a pond. We saw the herb garden next to the Cabin which contained some herbs I knew, and a lot I did not know, There was lots of blooming stuff including milk weed, so all week the Monarch butterflies stopped by for a snack on their way south for the winter. There were stinging nettles which are edible, but also have medicinal uses, Comfrey planted for it’s deep root that brings up nutrients, the leaves can be used as mulch. Yarrow and plantain are nutrient accumulators, There was a small Curly Willow next to the pond which can be cut down and will grow back from the roots (coppiced) There was a water plant in the pond… The herb garden area was a meandering Keyhole garden to improve edges and supply many different plants- there were about 100 different plants in about 100 sq feet- and room for more. The Cabin had 2 vines…a kiwi on one side… that was loaded with kiwis, and a hops plant on the other. There was also a fig tree that had ripe fruit on it. 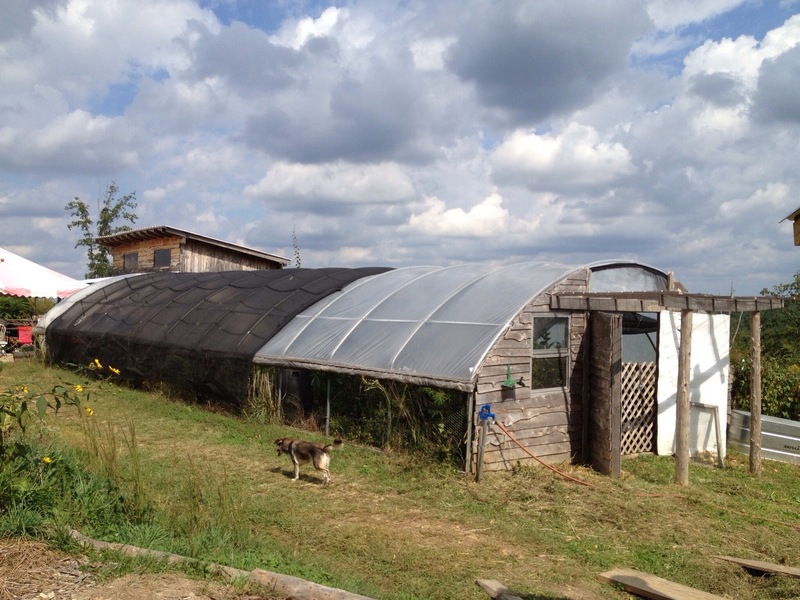 There is a 50 foot green house that has baby trees waiting to be planted, a large overgrown basil (maybe left over from the winter- I saw it outside as well, A barrel full of duckweed to restock the pond in the spring, a greenhouse inside that was insulated for warmer space- it was currently empty. There was a large metal tub which they us to mix up planting medium, which they make themselves from 3 or 4 ingredients. 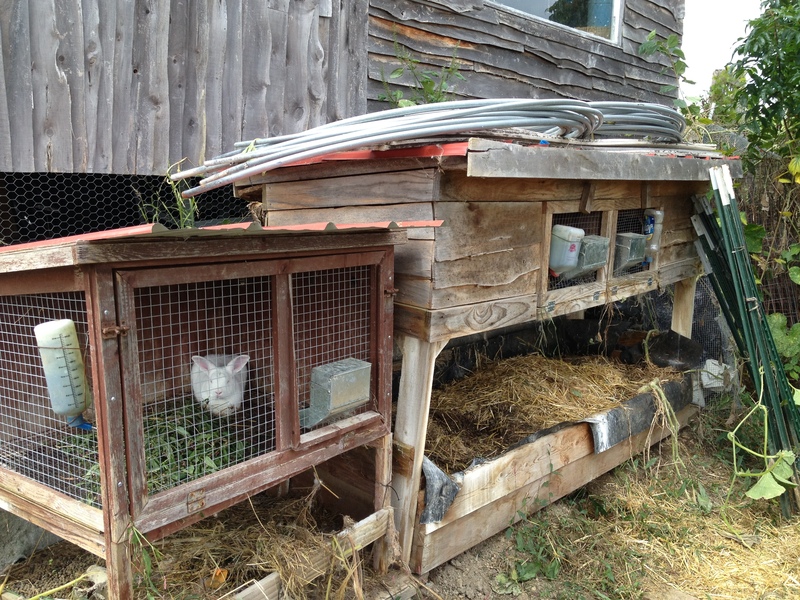 We saw the rabbit hutch which fertilizes the worm composting operation, where they add coffee grounds and egg shells. They have 1 buck and 2 does, which can supply you with a rabbit every week if all goes well and you don’t name them. We fed the rabbits greens from the garden and rabbit kibble. Next to the rabbits was the gate to the chicken house where they had 17 chickens one of which was a rooster. There was netting over the chicken house, probably to discourage hawks. The chicken house had 3 nesting boxes, which were accessible from outside, so you could open it to collect eggs. Ducks from the duck pond can come into that area, as well as the chickens can out into the duck area. Cliff doesn’t like the chickens too much, he thinks they scratch too much, he is planning to phase them out in favor of the ducks…but then they will have to hunt for eggs. The Vegetable garden was below the greenhouse and was mostly finished with the summer vegetables, There were still lots of tomatoes, and comfrey was planted there as well as huge marigold plants. The water from the upper herb garden drained into the vegetable as well as some irrigating with a hose…which they also use to water the animals. Lunches were generally soup and salad- They came up with amazing soups, and I loved all the salads. Jen made several different fermented sauerkrauts, but sometimes green salads and coleslaw, and always interesting dressing and condiments. 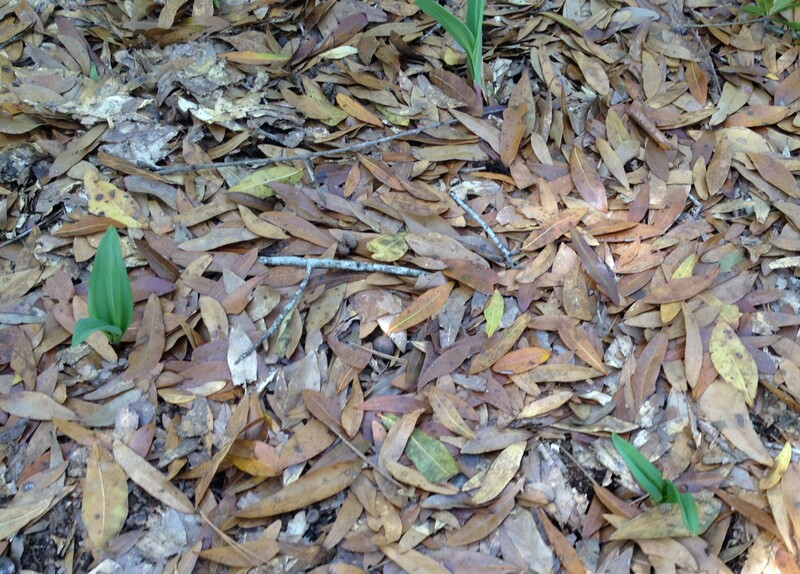 Patterns in Nature- One of my favorite classes. Dendritic patterns of trees both in the branches and roots…It reminded me of Antoni Gaudi and his amazing cathedral in Barcelona, Spain. Hexagon as in honey bees. Nesting patterns of tree rings and rainbows, Lobing as in flower petals and pine cones. 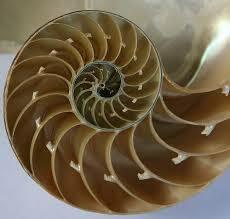 Spirals…ahh the amazing spiral. Start with hair swirls and finger prints then move to zinnias and hurricanes. 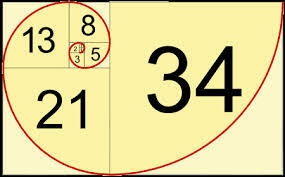 Then consider the Fibonacci sequence which is found all over in nature…it can be a whole blog in itself. Stars for explosions and dandelions, Snowflakes. And finally Overbeck Jet which is like breaking waves, and mushrooms and atomic bombs and bones connected, and musical frequencies. Imposing squares and rectangles on natural patterns creates problems- poor wind and water flow and less edge effect. Natural patterns are more harmonic. After a delicious dinner, they set up the computer and we watched case studies on u-tube…Sepp Holtzer- the wild permaculturist in Austria, An edibile food forest in a Davis, California subdivision, Geoff Lawson an Australian permaculture guru talking about urban permaculture and several more. Totally exhausted, Miriam and I were both staying at the Farm, carpooled back. I desire to stay in bed and pull the covers up to stay warm… this is the coldest winter I remember since I left Los Alamos in 1975. May we all try to live in the here and now. 2. 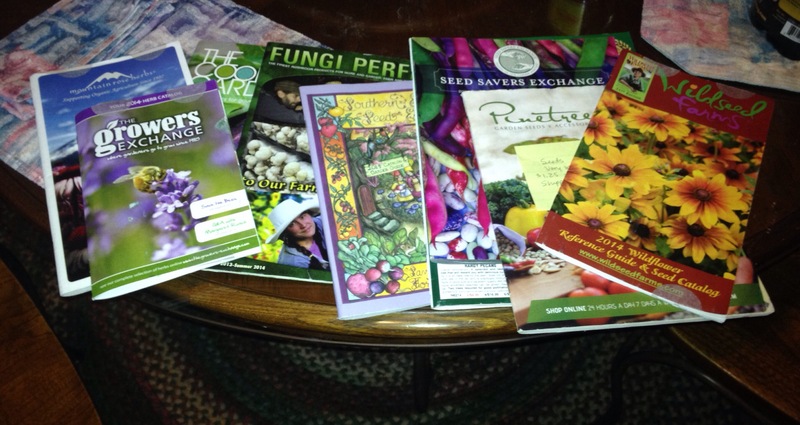 Seed catalogs are awesome. My favorite to date is Wildseed Farms http://www.wildseedfarms.com. They have many of the flower seeds I need to help build diversity in my yard for improved insect action. I want to encourage beneficial insects and discourage others. They have good regional wildflower mixes, and packets of individual flowers about $1.25 per packet and shipping is very reasonable. 3. If you prefer plants to seeds, I bought plants from the Growers exchange- http://www.growersexchange.com individual plants at $5.95 each- They came nicely boxed up and with instructions on how to plant. 4. and I love Mountain Rose Herbs…wwwmountainroseherbs.com. I have ordered herbal Tea and seeds from them, they sent my items promptly. They have a good selection of hard to find herb seeds. They also give discounts to people taking Herbal classes. 5. An awesome blog is Chriscondello A plant a day till Spring http://chriscondello.wordpress.com/2014/01/20/a-plant-a-day-till-spring-day-31-passionflower/ His pictures are inspiring me to try some of his plants in my garden this year. 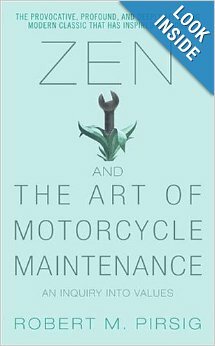 I wanted to mention my favorite blog not about permaculture, but also coming from Australia. The Natural world unaided by humans does a great job of taking care of itself. If we were no longer here, the planet would evolve into a wild abundant space. So our challenge is how to make that happen with human beings still here. We could do it by mimicking natural processes- helping the water flow, choosing diversity, creating edges, and working with other humans in a cooperative way. This is my definition of Permaculture.